Download the idropt VDMX template project for the Livid OhmRGB Slim. For today's guest post we're joined by eatyourwork who first introduced us to the possibilities of using OhmRGB Slim alongside of VDMX in a blog post a couple of years ago. Since then we've made a few basic templates for new video performers to get started with a simple VJ video mixer setup with the Ohm, but in this video tutorial Simas shows off the extent to which you can customize your layout and MIDI mapping when making your own video performance rig. 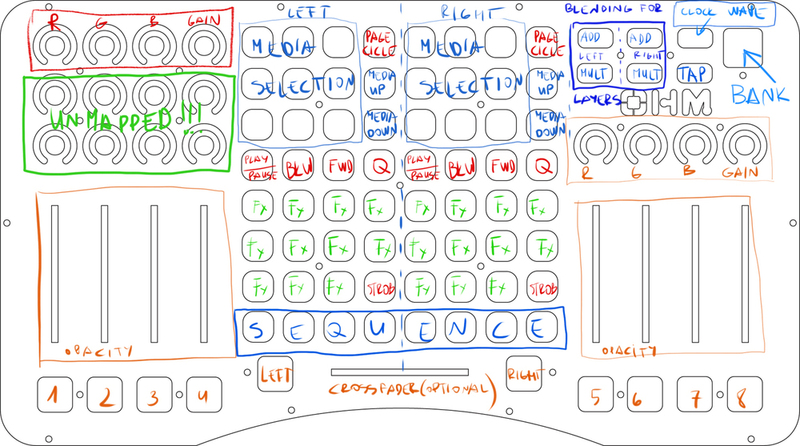 Along with using pads for triggering of video clips, this template makes use the echo mode for MIDI talkback setup for lighting up the Ohm's LEDs in different colors to reflect the states of FX being applied to each layer. After trying out this template for yourself, check out some more tutorials to learn how to customize the setup even further. Performing visuals with OhmRGB & VDMX. Paper sketch outlining custom MIDI mappings.